Monique has served as a Student Financial Aid Advisor II in the Office of Scholarships and Financial Aid at Georgia Tech for five years. She has received numerous recognitions for her outstanding service to students and parents. She leads countless presentations on and off campus about the Financial Aid Process and took her service further in Fall 2016 by teaching a section of GT 1000, First-Year Seminar. Monique strongly believes in the power of encouraging and empowering others and her decision to become a coach allows her to reach students on another level. She understands the impact she can have by being a supporter of students in their college years and seeks to influence and empower her coachees. Monique believes that leadership is a continual process that does not take place overnight. It requires passion, skill, repetition and commitment and she looks forward to learning and growing with her coachees. Don’t ask what the world needs. Ask what makes you come alive, and go do it. What the world needs is people who have come alive. 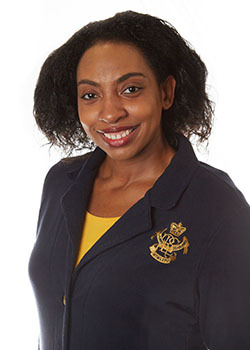 LaToya Ballard currently works within the Georgia Tech Athletic Association as Assistant Director for Student Athlete Academic Support Services, providing academic support to several student-athletes and teams within the department. She made her way to Atlanta after working within several athletic departments throughout the south east over that past 9 years. She is Florida native and earned both her Bachelor’s and Master’s Degrees from The University of Central Florida in the areas of Health Education and Sport and Fitness. LaToya has seen that while it has been her role to help and advise the students that she works with, they in turn have helped her grow personally and professionally as well along the way. Throughout the past 10 years that she has been working with students she has seen a multitude of highs and lows that students encounter; she hopes to bring all of these experiences to this role. As a new Leadership Fellow she is looking forward to this journey and all the new experiences that she will encounter through this program. Alex received his B.S. in Accounting at Bentley University in Waltham, MA in 1991. After a brief stint as an Auditor for Webster Bank in Waterbury, CT, Alex returned to school and graduated from the University of South Carolina with a M. Ed. in College Student Personnel in 1994. Alex worked in Housing and Residence Life at Loyola University – New Orleans and the University of Connecticut before moving to Georgia in 2000. He started working for the Housing Department at Georgia Tech in 2001 and has served in three different roles over the years. He is currently the Associate Director of Residence Life and is responsible for all the Undergraduate Apartment spaces on campus. Alex chose to become a leadership fellow because of his desire to continue to develop his own leadership skills and to develop different types of relationships with students. The Institute offers a lot of challenges to its students and Alex believes leadership coaching is a great way to assist students in their own personal journey towards their personal and professional goals. Robert Bonds is a minister; philanthropist and public speaker dedicated to inspiring others to find and develop their gifts to make a great impact on the human race. Robert is the founder of the Trinity Outreach Organization, which offers assistance to the homeless and low-income families. Robert is a huge believer that with the power of God, everyone can overcoming life’s challenging circumstances. As a result, he spends his time bringing reconciliation to broken marriages and relationships, not just between man and woman; but also between man and their God. Tracy has over 18 years in various roles involving program management, student orientation and academic advising. She has been at Tech for over 12 years. She currently serves as the principal staff advisor for Civil & Environmental undergraduate student registration, curriculum planning, and monitoring of student progress towards graduation. In addition, she leads the CEE undergraduate recruiting efforts as well as support the Associate Chair and Chair with program assessments. Tracy believes that in any learning evironment leadership styles says alot about that person's educational beliefs. Developing leaderhsip skills and attribues are important before you get out into the professional world, which is why college is a great place to develop these qualities. Hailing from New York City, Jessica earned her B.S in Business Administration from CUNY and a MBA from Long Island University. She worked at the City University of New York (CUNY) system as a Director of Admissions and Recruitment for Undergraduate Enrollment. Since then she relocated to Atlanta and established the International Credentials Division for the Robinson College of Business MBA Programs at Georgia State University. She arrived at Georgia Tech in 2010 and has held leadership roles in the College of Computing's School of Interactive Computing Graduate Program. Currently, her digital enrollment expertise is with the Online Masters Program serving students worldwide. Jessica chose to become a Leadership Fellow because the program allows her to collaborate with emerging leaders and share practical advice for advancement in a global society. As a higher education advocate she believes education is the cornerstone of our lives as individuals, a community, and a nation. She is thrilled to add another rewarding GA Tech experience and develop deeper human connections in her life's journey.